Today, we celebrate Thanksgiving and in that spirit, we decided to start a new tradition in our family this year. 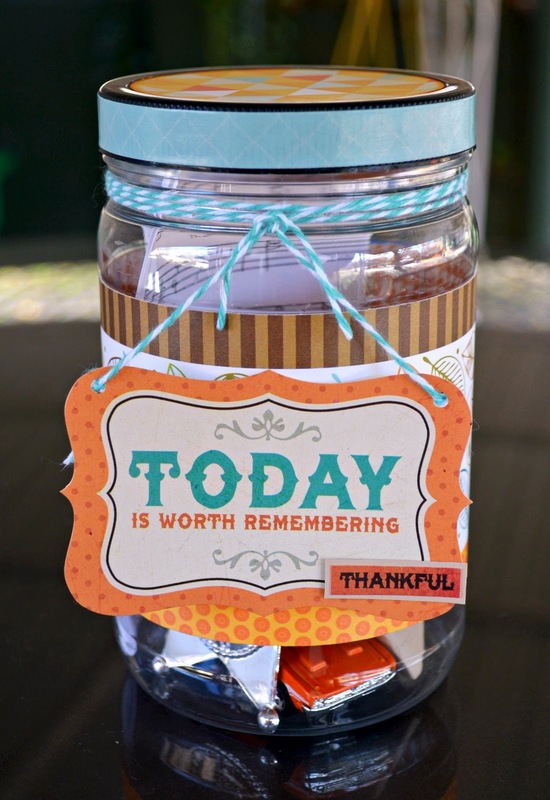 We asked everyone who came to Thanksgiving to bring a small item that could fit in a jar to represent something they did or something that happened this year that they are thankful for. The item didn’t have to represent something big and meaningful, just anything that came to mind. Some items were light-hearted or funny and some represented more life-changing moments. In addition to the objects, we each wrote a sentence or two on a slip of paper, dated and signed it, and added it to the jar. Some of the items we included were: a canceled forever stamp from a letter, an airline ticket from trip, an old family photograph, ticket stubs from a Broadway show, a favorite Bible verse, a flashcard for school progress, my son’s handprint, a toy car to represent a real one, music from a Church program, a silk flower, a sweet note from Aunt Patty, a silver spoon from Nana, a shell from the beach, a plastic sheriff’s badge for my brother's graduation from the police academy, an Apple sticker to represent our love of the iphone, and a receipt for the Thanksgiving turkey. 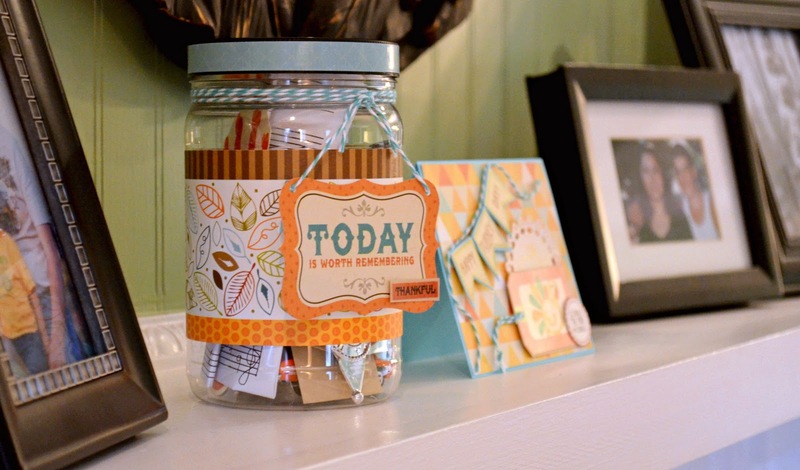 We are going to keep the jar on a shelf in the den and add to it throughout the coming year. 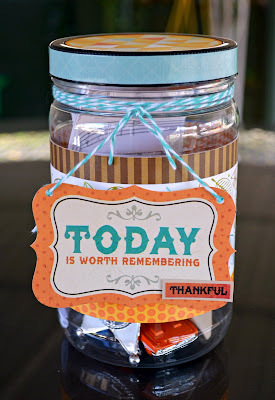 Then next Thanksgiving, we’ll open the jar, examine the contents, count our blessings again and add new items. To decorate the jar, I used a border strip from Bella Blvd's Finally Fall, stickers from Crate Paper's Farmhouse line and some twine from The Twinery. For the top of the lid, I added a circle punched from Studio Calico's Countryside. Happy Thanksgiving to each of you. 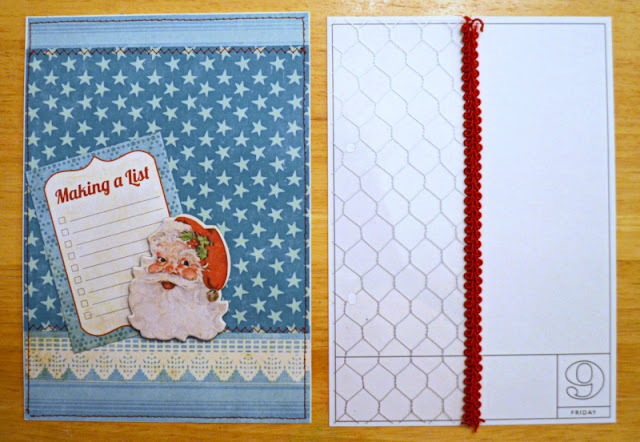 This is my first year doing a December Daily and I am having so much fun with it. 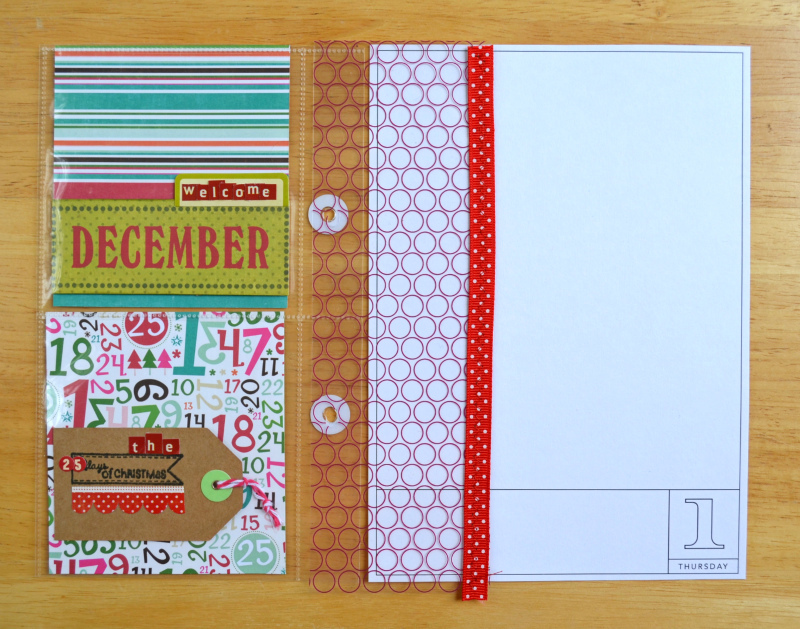 December Daily is a concept started by Ali Edwards. Essentially, it is a mini-album that chronicles bits of daily life for the first 25 days of December. 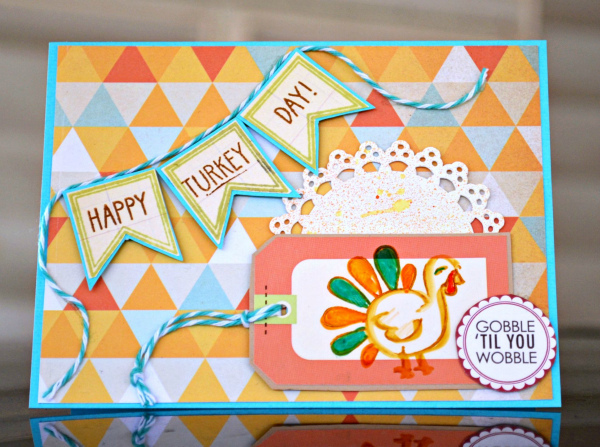 This year, Ali teamed up with Studio Calico to offer a December Daily kit and I purchased the kit. I love the album in the kit. 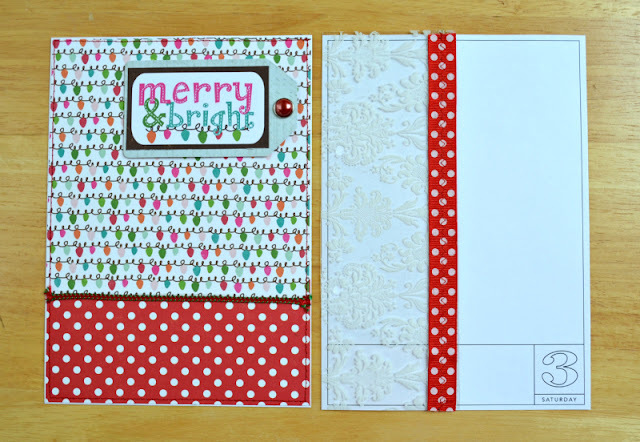 It’s a small, plain chipboard album made by American Crafts with 3-inch rings and 25 page protectors, measuring 6“ wide by 8.5“ tall. It’s a fun size. 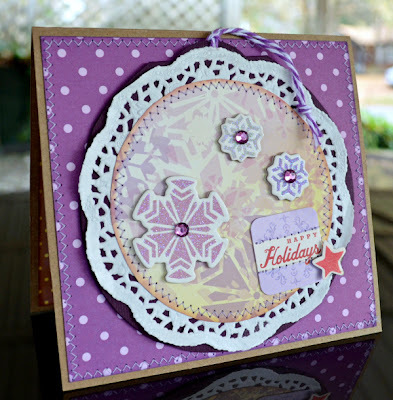 The kit came with assorted paper and embellishments but I decided to forego most of the kit and instead use primarily Echo Park. My entry for December 1 looks like this. 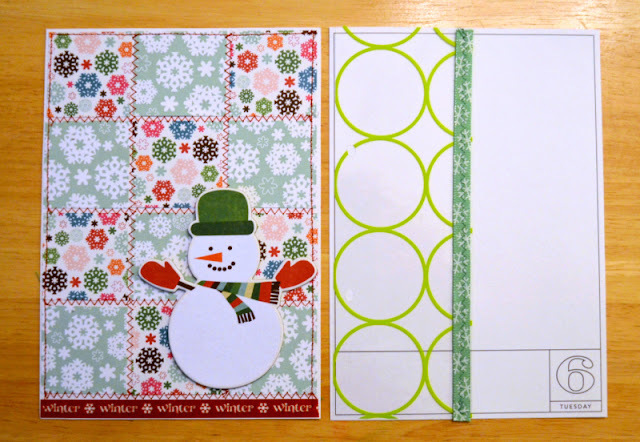 I followed Ali’s lead and used a calendar page on the right and a decorative element on the left. 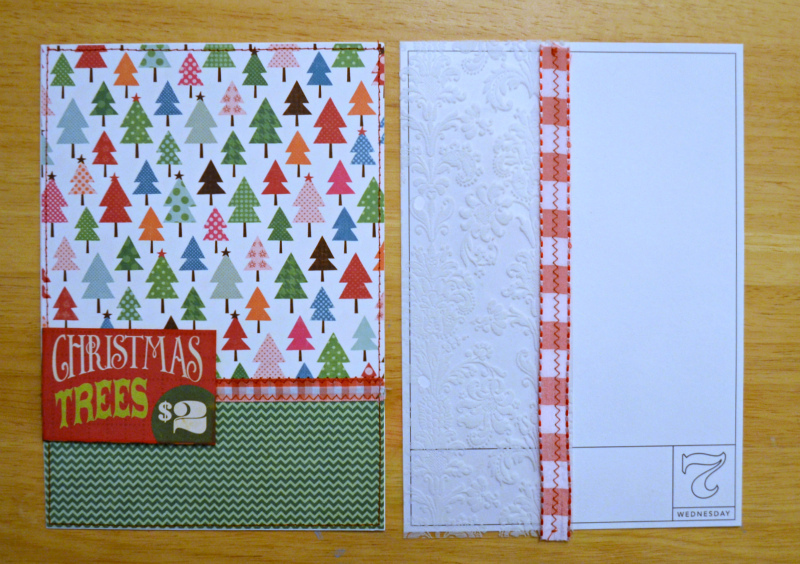 Here I used 4-inch square pockets to hold introductory elements. 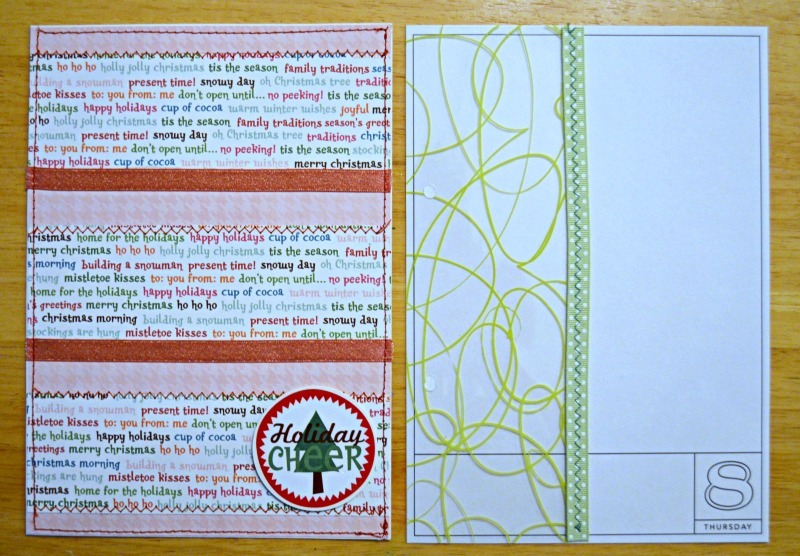 The top square says: Welcome December; the bottom square says: The 25 Days of Christmas. 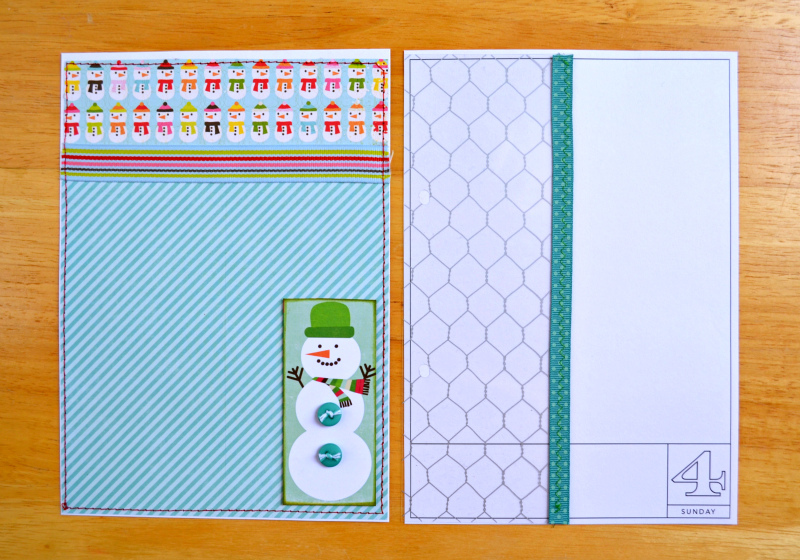 To make the pockets, I used a 12x12 WRMK photo page protector that had 9 squares. 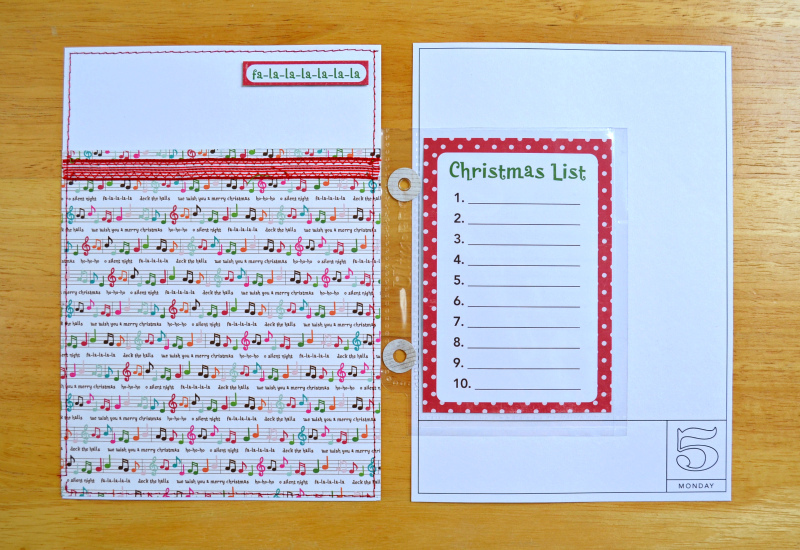 I cut the page protector to just two squares and punched new holes to fit the album’s rings. 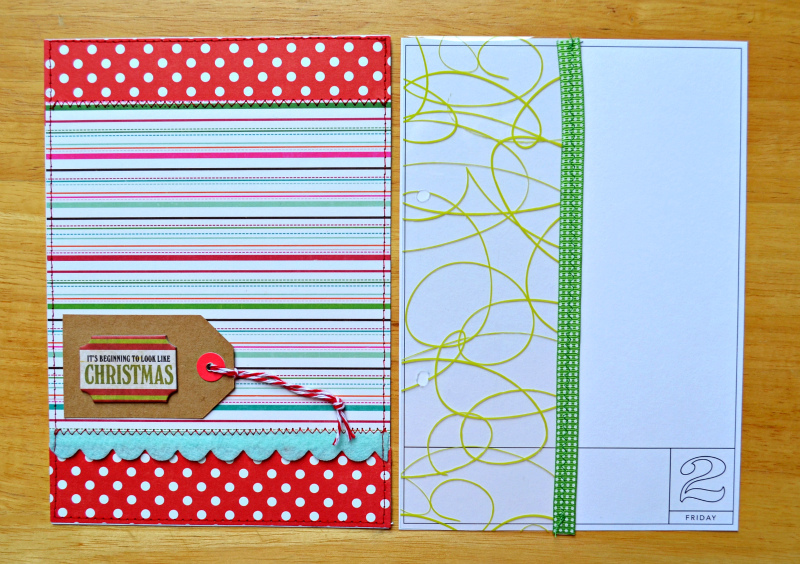 I will use altered page protectors like this sporadically through the album. My entry for December 2 is more typical of what the rest of the album will be: a decorative page on the left, a calendar page on the right and transparent divider in between. The calendar pages are digital overlays that Ali sells on her website. I'll use these pages primarily for journaling and photos of the day's events or to record a holiday memory. The left side of the spread is a decorative page. On these pages, I stitched a red frame around each page to give continuity day to day. Throughout the album, I used Echo Park paper and embellishments for the decorative page on the left side of the album. I primarily used a 6x6 pad of Holly Jolly and Metro Dots and Stripes. The snowman strip at the top of this page is from Echo Park's 2010 Christmas collection and the snowman at the bottom is a Holly Jolly journaling card. 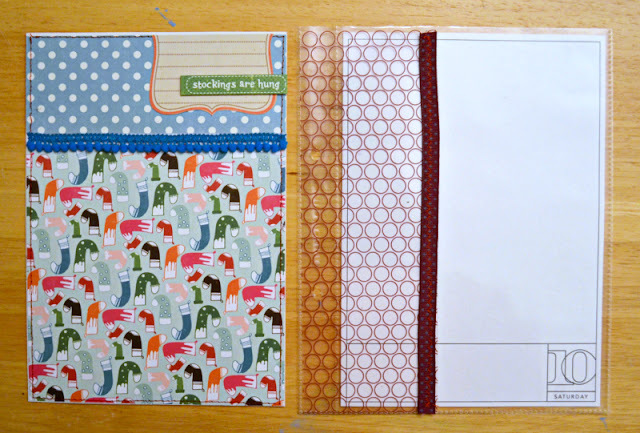 On Day 5, I used a small photo pocket (as I did on Day 1) between the left and right pages of the spread in lieu of a transparency divider. I tucked a journaling card in the pocket and will write my list in December when I get to this day. A lot of people put numbers on their foundation pages but I haven't added those yet, as I may move the decorative pages once December starts and I wanted to have that flexibility. You can see my December Daily Foundation Pages: Part 2 here. I wanted to post these at the end of October, but our internet service was kaput for a couple weeks due to some weather issues. I hope you will indulge me for a little Halloween wrap-up. I used Echo Park’s Apothecary line for all these projects. I so enjoyed this collection. First up, are some pillow box treats. 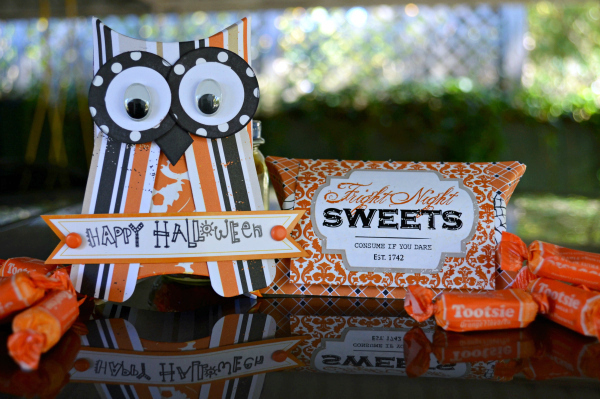 I took these to my son’s school and they were a big hit. They were super easy to do. I confess: I used pre-made pillow boxes from the wedding aisle at Michael’s and just covered them with patterned paper. Easy peasy! 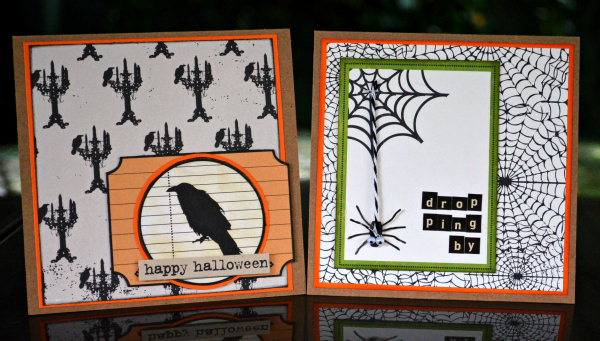 Then I made a couple of cards just for fun. And a wreath for the front door. Then, just before Halloween, I stopped by a thrift store and found a small wooden birdhouse for 25 cents. I took it home and started to paint it white, then realized it would be better painted black. 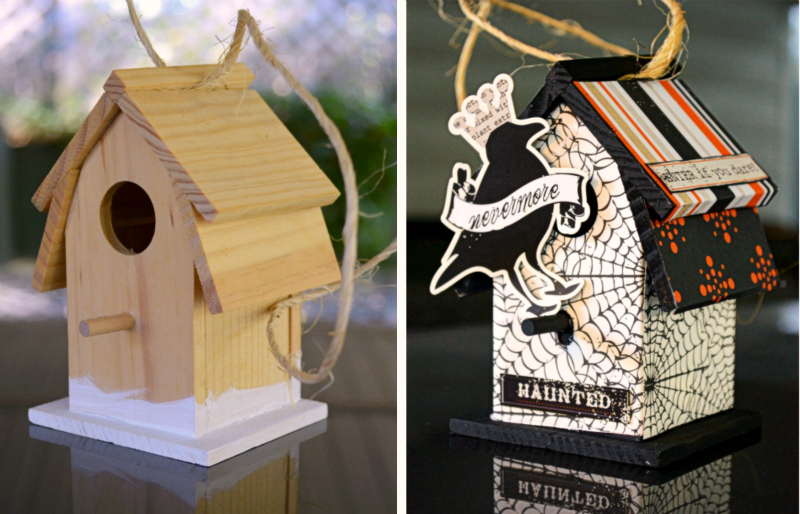 I covered the birdhouse with little scraps of Apothecary and added an oversized Raven sticker. We sat this on our bookcase in the den and it gave just the right Halloween feel to the room. Quote the raven: Nevermore!